Venite post me, faciam vos fieri piscatores hominum. Come and follow me, and I will make you fishers of men. that the blessed apostle Andrew may be as constant an advocate for us in Thy court as he was eminent in preaching and ruling over Thy Church. Amen. The Church celebrates the feast of Saint Andrew on November 30, an important date in the annual liturgical calendar, because it determines the date of the First Sunday of Advent, which is the Sunday nearest this Feast. Saint Andrew is the patron saint fishermen, and of both Scotland and Russia. Andrew, the first Apostle called by Jesus, was a fisherman from Bethsaida and the brother of Simon Peter. A follower of John the Baptist, Andrew recognized Jesus as the Messiah when John baptized Our Lord in the Jordan River, and he introduced his brother Simon to Jesus. The two brothers continued as fishermen until Jesus called them as Apostles. After Pentecost, it is believed that Andrew went to Greece to preach the Gospel of Christ Jesus. 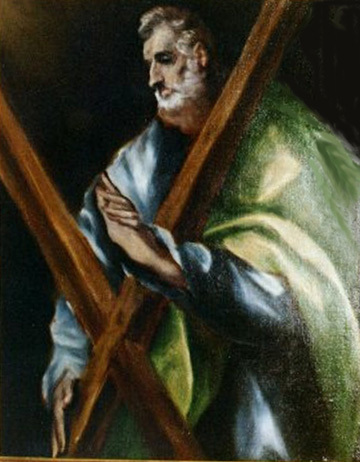 Saint Andrew, called the "Protoclet" (or "first called") by the Greeks, was crucified at Achaia by order of Roman Governor Aegeas during the reign of Nero. He was bound, not nailed, to the X-shaped cross in order to prolong his sufferings. According to tradition, he preached from the cross for two days, and died on the third day. This saint is the patron of Greece and Scotland. 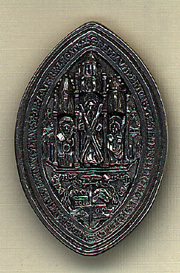 Below is a replica of the Great Seal of Saint Andrew, Scotland. The Cross of Saint Andrew, an X shaped cross, is visible in the center. The next day again John was standing with two of his disciples; and he looked at Jesus as He walked, and said, "Behold, the Lamb of God!" The two disciples heard him say this, and they followed Jesus. Jesus turned, and saw them following, and said to them, "What do you seek?" And they said to Him "Rabbi" (which means Teacher), "where are you staying?" He said to them, "Come and see". They came and saw where He was staying; and they stayed with Him that day, for it was about the tenth hour. One of the two who heard John speak, and followed Him was Andrew, Simon Peter's brother. He first found his brother Simon, and said to him, "We have found the Messiah" (which means Christ). He brought him to Jesus. Jesus looked at him, and said, "So you are Simon the son of John? You shall be called Cephas "(which means Peter). so he may be for us a constant intercessor before you. If you confess with your lips that Jesus is Lord and believe in your heart that God raised Him from the dead, you will be saved. For man believes with his heart and so is justified, and he confesses with his lips and so is saved. The scripture says, "No one who believes in Him will be put to shame." For there is no distinction between Jew and Greek; the same Lord is Lord of all and bestows His riches upon all who call upon Him. For, "every one who calls upon the name of the Lord will be saved." But how are men to call upon Him in whom they have not believed? And how are they to believe in Him of whom they have never heard? And how are they to hear without a preacher? And how can men preach unless they are sent? As it is written, "How beautiful are the feet of those who preach good news!" But they have not all obeyed the gospel; for Isaiah says, "Lord, who has believed what he has heard from us?" So faith comes from what is heard, and what is heard comes by the preaching of Christ. But I ask, have they not heard? Indeed they have; for "Their voice has gone out to all the earth, and their words to the ends of the world." R. The judgements of the Lord are true, and all of them are just. or R. Your words, Lord, are Spirit and life. As He walked by the Sea of Galilee, He saw two brothers, Simon who is called Peter and Andrew his brother, casting a net into the sea; for they were fisherman. And He said to them, "Follow me, and I will make you fishers of men." Immediately they left their nets and followed Him. And going on from there He saw two other brothers, James the son of Zebedee and John his brother, in the boat with Zebedee their father, mending their nets, and he called them. Immediately t they left the boat and their father, and followed Him. O God, who brought our fathers through the Red Sea and carried them safely through the deep as they sang the praises of Thy name, we humbly beseech Thee to guard Thy servants aboard ship and having repelled all adversities, bring them to the desired port after a calm voyage. Through Our Lord Jesus Christ, Thy Son, who lives and reigns with Thee in unity of the Holy Spirit, world without end. Amen. Sacred Heart of Jesus have mercy upon all seafarers. Our Lady, Star of the Sea, pray for us. St Andrew, pray for us. Lord save us or we perish. Saint Andrew is the patron saint of fishermen. An appropriate way to celebrate his feast is with a fish dinner. This can be as simple as buying fried fish carryout, or as special as the menu (below, with recipes) that appears in A Continual Feast by Evelyn Birge Vitz, originally published by Harper & Row in 1995, now available in paperback from Ignatius Press. At the blessing, it would be good to add the collect for the feast printed above. Optional: 1/2 cup chopped fresh mint leaves. Clean, rinse, and salt the fish. Rub with garlic, and brush with oil. Preheat the broiler. Place the fish in an oiled pan. Broil small fish about 3 inches from the flame, larger fish about 5 inches away. Broil split fish skin side down. During the cooking, baste generously with olive oil and a little vinegar or lemon juice. Mix the honey with the water in a large bowl. Sprinkle in the yeast and let sit until foamy. Stir in the barley flour and the salt. Gradually add the all purpose flour, mixing well between additions. Add the olive oil and the mint. Mix thoroughly. Place the dough on a lightly floured work surface. knead it for about 15 minutes, or until it is shiny and elastic. Add more flour, while you are kneading, if the dough is too sticky. Form the dough into a ball, and place it in a greased bowl. Cover with oiled wax paper and a towel, let the dough rise until approximately doubled in volume-1 1/2 to 2 hours. When a finger inserted into the dough leaves a hole that remains, the dough is ready. Punch the dough down with your fist. Put the dough on your work surface and cut in half with a knife. Knead each half into a ball. Cover the balls, and allow them to rise for 15 minutes. Form each ball into a large flattish loaf and place on an oiled pan. Make several slashes or a cross with a very sharp knife on the top of each loaf. Yields 2 eight inch flattish loaves. Variations: For a more pronounced barley flavor, increase the proportion of barley flour. Just remember that the bread won't rise as much. Substitute cinnamon or coriander for the mint. Mix the fruits, the honey, and the cinnamon. Form the fruit mixture into small cakes (about 2 inches across) or into little balls. Roll the balls or press the cakes onto the chopped nuts, coating them well. Yields about 12 cakes or 20 balls. Variations: Use chopped toasted almonds instead of the walnuts; substitute dried apricots for one of the other fruits. Saint Andrew is revered by Catholics in Scotland as their patron, and the saint's X-shaped cross appears as an emblem on the Scottish arms. The following recipes for scones (the Scottish "ancestor" of American biscuits) -- both traditional and simplified -- are variations adapted for the saint's feast. Combine the egg with the milk and add to the dry ingredients; then add the dried currants and mix well. The dough should be fairly stiff. Turn the dough out onto a well floured pastry board, and knead about ten times, adding more flour if necessary, to keep the dough from sticking. Reflour the surface, and roll the dough into a circle about 3/4" thick. Cut with a round biscuit cutter about 3" in diameter. Place the scones about an inch on a baking sheet, greased or sprayed with cooking spray. Cut a large "X" in the top of each scone (to represent Saint Andrew's cross) and brush them all with the reserved beaten egg (or with milk) and sprinkle them generously with granulated sugar. Bake the scones in a 350º oven for about 20 minutes, or until golden. Serve hot, with butter and honey or jam. The fish is a symbol of the Christian faith because the letters of the Greek word for fish, "ichthys" form an acronym for the Greek phrase, "Jesus Christ, Son of God, Savior". Early Christians, during the time of persecutions when it was not safe to be a known as a Christian, drew a fish in the ground in order to secretly identify themselves to other believers. Even today one sees this fish symbol, often containing the Greek letters spelling "fish", on religious articles and even on bumper stickers. To make the sun catcher, you will need paper, colored markers, colored pencils or crayons, scissors, cooking oil, paper towel, yarn or ribbon for hanging. Click on the fish image above for the full-size picture to color. 1. Print out copies of the fish design on plain white paper (even better, use white card or cover stock). 3. Wad up the paper towel and dip it in a saucer containing a small amount of oil, and apply the oil all over the colored drawing generously (but not dripping), letting it soak into the paper. Use a dry paper towel to remove excess oil. The oil will make the paper translucent, giving it a stained-glass effect. 4. Cut out the fish and make a small hole about half an inch from the top. Cut the yarn or ribbon about 12" long and thread it through the hole, then tie it to make a hanging loop. 5. Hang the Christian fish in a window so the light can shine through it, where it will be a daily reminder during the season of Advent of our life as Christians permeated by the Light of Christ. In the last two catecheses we spoke about the figure of St Peter. Now, in the measure that sources allow us, we want to know the other 11 Apostles a bit better. Therefore, today we shall speak of Simon Peter's brother, St Andrew, who was also one of the Twelve. The kinship between Peter and Andrew, as well as the joint call that Jesus addressed to them, are explicitly mentioned in the Gospels. We read: "As he walked by the Sea of Galilee, he saw two brothers, Simon who is called Peter and Andrew his brother, casting a net into the sea; for they were fishermen. And he said to them, "Follow me, and I will make you fishers of men'" (Mt 4: 18-19; Mk 1: 16-17). From the Fourth Gospel we know another important detail: Andrew had previously been a disciple of John the Baptist: and this shows us that he was a man who was searching, who shared in Israel's hope, who wanted to know better the word of the Lord, the presence of the Lord. He was truly a man of faith and hope; and one day he heard John the Baptist proclaiming Jesus as: "the Lamb of God" (Jn 1: 36); so he was stirred, and with another unnamed disciple followed Jesus, the one whom John had called "the Lamb of God". The Evangelist says that "they saw where he was staying; and they stayed with him that day..." (Jn 1: 37-39). Thus, Andrew enjoyed precious moments of intimacy with Jesus. The account continues with one important annotation: "One of the two who heard John speak, and followed him, was Andrew, Simon Peter's brother. He first found his brother Simon, and said to him, "We have found the Messiah' (which means Christ). He brought him to Jesus" (Jn 1: 40-43), straightaway showing an unusual apostolic spirit. Andrew, then, was the first of the Apostles to be called to follow Jesus. Exactly for this reason the liturgy of the Byzantine Church honours him with the nickname: "Protokletos", [protoclete] which means, precisely, "the first called". The Gospel traditions mention Andrew's name in particular on another three occasions that tell us something more about this man. The first is that of the multiplication of the loaves in Galilee. On that occasion, it was Andrew who pointed out to Jesus the presence of a young boy who had with him five barley loaves and two fish: not much, he remarked, for the multitudes who had gathered in that place (cf. Jn 6: 8-9). In this case, it is worth highlighting Andrew's realism. He noticed the boy, that is, he had already asked the question: "but what good is that for so many?" (ibid. ), and recognized the insufficiency of his minimal resources. Jesus, however, knew how to make them sufficient for the multitude of people who had come to hear him. The second occasion was at Jerusalem. As he left the city, a disciple drew Jesus' attention to the sight of the massive walls that supported the Temple. The Teacher's response was surprising: he said that of those walls not one stone would be left upon another. Then Andrew, together with Peter, James and John, questioned him: "Tell us, when will this be, and what will be the sign when these things are all to be accomplished?" (Mk 13: 1-4). Peter, his brother, travelled from Jerusalem through Antioch and reached Rome to exercise his universal mission; Andrew, instead, was the Apostle of the Greek world. So it is that in life and in death they appear as true brothers - a brotherhood that is symbolically expressed in the special reciprocal relations of the See of Rome and of Constantinople, which are truly Sister Churches. A later tradition, as has been mentioned, tells of Andrew's death at Patras, where he too suffered the torture of crucifixion. At that supreme moment, however, like his brother Peter, he asked to be nailed to a cross different from the Cross of Jesus. In his case it was a diagonal or X-shaped cross, which has thus come to be known as "St Andrew's cross". "Hail, O Cross, inaugurated by the Body of Christ and adorned with his limbs as though they were precious pearls. Before the Lord mounted you, you inspired an earthly fear. Now, instead, endowed with heavenly love, you are accepted as a gift. "Believers know of the great joy that you possess, and of the multitude of gifts you have prepared. I come to you, therefore, confident and joyful, so that you too may receive me exultant as a disciple of the One who was hung upon you.... O blessed Cross, clothed in the majesty and beauty of the Lord's limbs!... Take me, carry me far from men, and restore me to my Teacher, so that, through you, the one who redeemed me by you, may receive me. Hail, O Cross; yes, hail indeed! ".